We all dream of having a Mother’s Day where our families anticipate our every need. Where they line up to do things that will bless us. Where we don’t even have to say anything because they are tuned in to our desires and have an entire day of pampering laid out for us. And then reality sets in and we can be very disappointed by what actually happens on Mother’s Day. First, we need to get our expectations in line. Unless you’re extremely fortunate, you’ll probably never experience your ideal Mother’s Day fantasies this side of heaven. 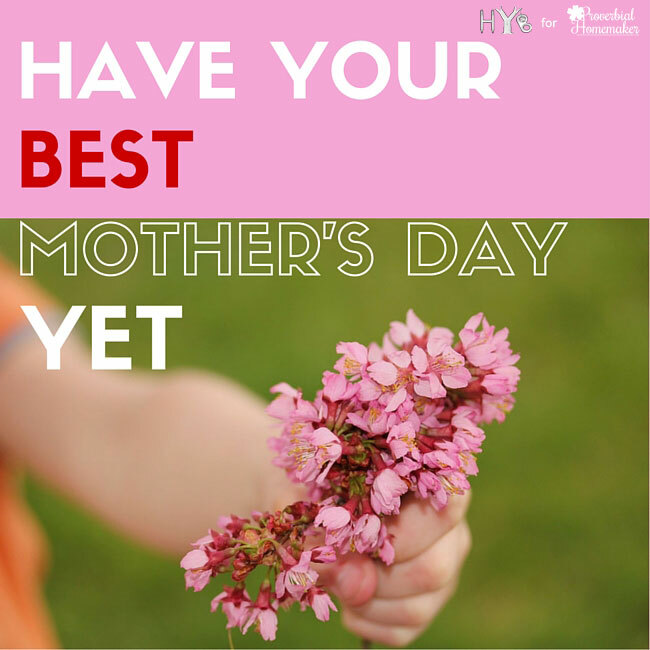 There is one SIMPLE way to be sure you will have your best Mother’s Day yet, however. All you need to do is tell your husband what you want. That’s right! Tell him what you want. Women are notorious for dropping hints and expecting their husbands to pick up on them. Unfortunately, that doesn’t always happen. Our mom or sister or best friend might be able to anticipate our needs and discern what we would like for Mother’s Day – but this is a much more difficult, if not impossible, task for our husbands. Men can’t read our minds. No matter how much we would like to pretend that they can… they can’t. Sometimes, that’s a good thing. At least in my case! I’m glad no one can read my mind when I’m having a selfish moment. If you have ideas about what you’d like to have happen on Mother’s Day, tell your husband. Give him specifics. Rather than say, “I’d like to have a romantic day” or “I want to have some family time” or “I’d like you to pamper me” tell him exactly what you have in mind. If you want him to draw you a bubble bath and sprinkle red rose petals in the water, let him know. If you want to go on a walk with the family on your favorite hiking trail, tell him. If you’d like your husband and kids to make you lunch and do the dishes, let him know that as well. Chances are, he’ll be happy to fulfill your requests. He just doesn’t have any clue what you want. If you aren’t sure what you’d like to have happen, then sit down with your family and have a brainstorming session. Once the ideas are flowing, you might be surprised by some of the clever and thoughtful things they come up with. It’s important that you give your family time to prepare, however, so be sure to do this a few weeks before Mother’s Day. Most families really do want to make us feel special and pamper us. They just become paralyzed by indecision – or have extremely misguided views of what will make us happy. This year, take the pressure off of your husband and enable him to give you the kind of Mother’s Day you’ve been dreaming about! 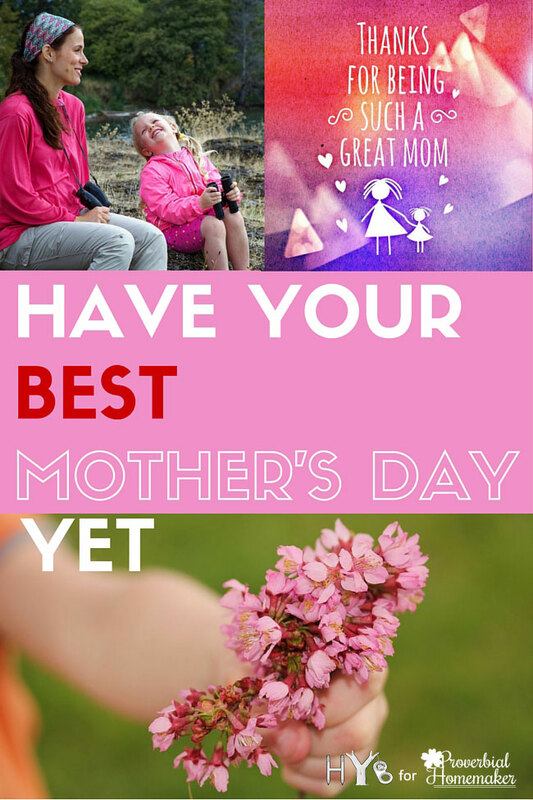 Give your family the gracious gift of giving you your BEST Mother’s Day yet! Like these Mother’s Day tips? Pin it for later! Question: Do you tell your husband how you’d like to celebrate Mother’s Day? I’d love to hear about your very best Mother’s Day so far. Please leave a comment below!